Are you looking for artificial grass in California? Look no further—Watersavers Turf, the premier suppliers of artificial grass in CA, can help. We’re ready to ship our turf products any place in CA (or the Continental US, for that matter). Designing a home yard, commercial outdoor lounge, dog run, or a sports venue? We have just what you need for your artificial grass project. Watersavers Turf has a huge selection of fake turf styles. Need to see and feel the product this before placing an order? No problem. We have free 1′ x 1′ samples at all of our locations. You can even chat with us online or call us direct to ask for turf samples. Would you like to find the best price for artificial grass in CA? Watersavers Turf has the most competitive pricing in the industry. To find out just how good our prices are, we offer free estimates. We’ll discuss your job and leave you with a better sense of how much (or how little!) it will cost you to install fake grass in CA and beyond. Do you own a home and want a green yard but don’t want to care for it? Do you run a store and need to cut upkeep costs? Or is your school board looking to install a new sports field that won’t cost much? No matter what, we work hard to help you find the right turf products for your project of fake grass in CA and in any state. Desert regions. Drought. For many reasons, landscape work in these spots can be hard. It’s tough to grow a lush, green lawn here. It’s even harder to care for it. Watering one costs money and uses up resources. Mowing it sends carbon into the air. Forget the dream home—just keeping your lawn in shape here can be a nightmare! But it doesn’t have to be. Thanks to fake turf, you can have a perfect lawn and save money too. Experts place the yearly cost to care for 1000 square feet of sod at about $2,360—yearly upkeep for fake turf, on the other hand, only costs around $200. On top of that, artificial grass rebates in California result in even more savings. To save resources, local leaders offer artificial grass rebates in CA water districts. If you switch out real grass for faux grass in your yard, they’ll reward you with cash. You don’t need to water it. You don’t need to mow it. Earning artificial grass rebates in CA towns is just another reason to make a change. When you buy fake turf from Watersavers, we will refer you to pro landscape contractors that can help with your artificial grass installation in California. For contractors, we offer free classes on how to do artificial grass installation in California. Those who attend get a $50 credit (if they are first-time buyers), FREE magnetic signs for their cars and trucks, and FREE metal signs for job sites. Best of all, they get top skills that are needed to do artificial grass installations in CA. We carry the best artificial turf products in California because we know how important it is for the environment. We only sell lead-free and non-toxic turf. With residential artificial grass, commercial synthetic grass, pet grass, artificial sports turf, as well as artificial turf accessories and tools, you won’t find a better supply of artificial turf products in California. Our stock includes color options, turf pads, one of a kind styles, and all you’ll need to install and care for your faux grass. We are the best choice when it comes to having the safest and highest quality artificial turf products in CA. Planning to add fake grass to your home? When you install residential artificial grass in California, you have some options from which to choose. We offer turf that can be used to build a full, green lawn. We also offer styles that are great for a backyard sports field. No matter what your goals are, the reasons to use residential artificial grass in California are clear. It will always stay the same color. You don’t need to water it. Upkeep is easy. On top of that, when you buy residential artificial grass in CA from Watersavers Turf, you can choose from over sixty types. This makes it easy to find the right match for your plans. People who own homes aren’t the only ones to save with our products. With the best commercial synthetic grass in California, business owners can transform their property and boost their savings. Make your hotel roof into a lounge spot for guests. Keep your sports venue open even after rain. Add some color to an outdoor mall. No matter what field you’re in, installing commercial synthetic grass in California saves you money that you can invest back into your business. By using less water, you can promote yourself as “going green.” Doing so will help you attract even more clients. Putting commercial synthetic grass in CA businesses is good for your bottom line and the planet. Pet owners know full well that a messy yard can result in a messy home. It’s nice to you let your furry friend sprint around outside. Sadly, they tend to bring a lot of dirt and debris back with them. That’s why more and more people are opting to install fake pet grass in California. Yes, it keeps your home from turning into a war zone when your dog comes back from his run. That’s not the only reason it’s a good choice. With non-toxic pet grass in California, you can be sure that your little buddy is safe from poison, bugs, or harmful plants. If you run a kennel or pet daycare, you can use faux turf to draw in more clients. When people install pet grass in California kennels, they keep the insides of the buildings cleaner—this helps to boost their appeal. Pet owners are also happy to know that their dogs have a safe spot to play while they’re away. As such, they’ll be more likely to choose your kennel when they need one. Keeping a sports field in good shape is not easy. It’s even harder when your league or district doesn’t have enough money for upkeep. Fields can become unsafe after rain. You need to maintain them to keep them ready for a game or practice. Intense play can cause damage. Costs add up. Safety is always a concern. That’s why many have made the switch to artificial sports turf in California sports fields. Unlike real grass, schools can afford it thanks to low upkeep costs. Teams prefer using artificial sports turf in California because they can play even after rain. Fans are happy because games don’t get canceled due to a messy field. Best of all, we only offer the safest artificial sports turf in CA. It’s lead-free and non-toxic, with no crumb rubber infill. This means there is no threat to player health. Thanks to special high-tech blades, the surface stands up to the beating it takes during games. With extra padding, there’s less risk of injury. There’s no reason not to use it. People who opt to use fake turf find it easy to maintain. With no watering, trimming, mowing, or fertilizing, it greatly reduces their workload. Of course, if you install it yourself, you need the right tools. That’s why we offer the best selection of artificial turf accessories and tools in California. Take the EasySeam, which speeds up the process of binding turf seams—this saves you both time and effort. We also sell lawn pads. These pads go beneath the turf surface to provide added safety. If you run a golf course, we even have golf flags. From glue to weed barriers, we’re the top supplier of artificial turf accessories and tools in California. Again, this type of surface doesn’t need much lawn care. You won’t need to buy a mower. But you will need a source for artificial turf accessories and tools in CA. That’s what you’ll find at Watersavers. If you’re looking to find artificial grass in your California county, you’re in luck. Thanks to our many stores across the state, it’s easy. Don’t have the time to stop by? We’ll ship our products right to you. In any county, you’ll find a use for faux grass. When you buy from us, you’ll also get the best service and price. That’s because we love this state, and want to help save our precious resource, water. That’s why we offer the most competitive pricing and hire the most knowledgeable and friendly staff. Sonoma, Marin, Contra Costa, Alameda, Sacramento, Santa Clara, San Francisco, San Mateo, Alpine, Amador, Butte, Calaveras, Colusa, Del Norte, El Dorado, Fresno, Glenn, Humboldt, Imperial, Inyo, Kern, Kings, Lake, Lassen, Los Angeles, Madera, Mariposa, Mendocino, Merced, Modoc, Mono, Monterey, Napa, Nevada, Orange, Placer, Plumas, Riverside, Sacramento, San Benito, San Bernardino, San Diego, San Joaquin, San Luis Obispo, Santa Barbara, Santa Cruz, Shasta, Sierra, Siskiyou, Solano, Stanislaus, Sutter, Tehama, Trinity, Tulare, Tuolumne, Ventura, Yolo, Yuba. No matter where you live in the state, if you’re trying to find artificial grass in your California city, we can help. If you live near one of our locations (Brentwood, Concord, Dublin, Petaluma, San Jose, San Rafael), you can head on over and see our products for yourself. If not, we’ll ship your order to you. CA is home to many great cities. Artificial grass belongs in all of them. It’s no secret that there’s always a lot to do in this state. This is clear for sports fans. Each March, they get to head to the BNB Paribas Open. This tennis event is held at the Indian Wells Tennis Garden. As one of the second-largest tennis stadiums in the world, it draws a big crowd. The fact that the venue boasts fine dining and gorgeous landscapes also helps. The BNB Paribas Open itself may be the major draw, but without the Indian Wells Tennis Garden, it wouldn’t be such a success. The BNB Paribas Open is one of CA’s great annual events. Fake turf can help to ensure this remains the case. All over the world, teams and tennis court owners have found that it is a tough surface and perfect for this type of sport. As more athletes take notice, it’s likely that those who run tennis venues will make the upgrade. Players are happy with a court they can rely on. Owners are happy to drive down their costs even further. Is tennis not intense enough for you? Need something with a little more thrill to it? If you’re a motor sports fan, you’re in luck: the state is also home to the Auto Club Speedway. This site in Southern CA plays host to car races and events all throughout the year. Auto Club Speedway has 600 TV screens and enough food to keep the crowds happy. A trip to this event is a must for anyone who wants to get feel of some CA auto-based excitement. It’s not just about the race, though. The grounds at the Auto Club Speedway are well groomed. You will be able to relax and enjoy the day being surrounded by a real lush lawn. The cost to maintain its look is a huge expense for the track owners. We are hopeful that they will come to realize their expenses are better spent when they choose to install fake grass. At many other racetracks, owners have installed faux grass to keep the lawn green and mud-free. This ensures that every day at their track is a beautiful one. The history of artificial grass in CA is tied to its climate. This state is no stranger to drought. Since 1917, it’s gone through nearly nine dry periods. In fact, some recent years have been the driest since experts started keeping records. 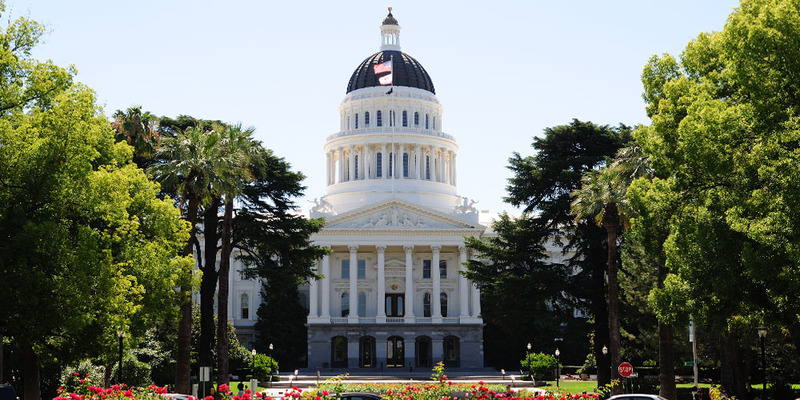 The history of artificial grass in CA has given the state a chance to handle the issue. Leaders in many water districts now offer rebates to those who will replace their real grass lawn with a fake grass lawn. Instead of wasting a scarce resource on lawn care and upkeep, people can now save much more water and still enjoy their yards. Not a minute too soon, in fact. As of late 2016, the people of CA appear to have stopped saving water for three months in a row. To conserve more, changes need to be made. You can be one of the first to take the right step. Watersavers Turf can help you become part of the history of artificial grass in CA. Stop by one of our locations to pick up our free 1’ X 1’ samples, or visit us online to get a free estimate. If you have any questions, you can chat with us online 24/7, or you can call us at 844-974-8874. Start making a difference today!